South Korea underwent rapid economic development under a semi-military, virulently anti-communist government which banned trade unions and kept close checks on the economy. 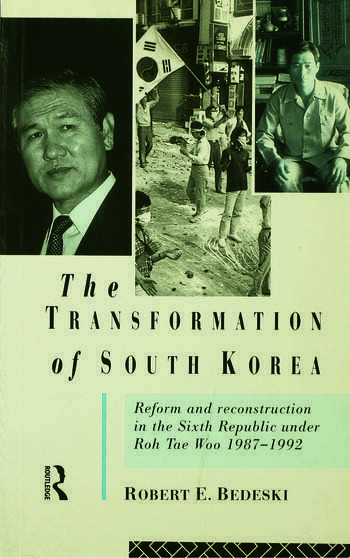 President Roe Tae Woo has, however, since 1987, introduced electoral and social reforms. Strikes and wage rises have followed, leading to a loss of competitive edge, and the growth of opposition parties has resulted in political stalemate. Robert E. Bedeski provides a thorough analysis of the institutions of government in South Korea and how they have been transformed by the introduction of political pluralism, and of the attempt to liberalize without undermining economic success. He also examines the new political parties and their role within the framework of the South Korean political system, as well as their social context. State reforms are compared with developments in Taiwan, the Phillipines, North Korea, China and the former Soviet Union. The major themes of state-building an deconomic development are thoroughly explored. The author also deals with South Korea's international environment and changing foreign policy. Robert E. Bedeski has lived and worked in various parts of East Asia since 1959, has taught and written about the comparative politics and international politics of the region. He is now Professor in the Department of Political Science, University of Victoria.